It’s easy to feel lost in the maze and excitement of RC vehicles. That’s true not only for wide-eyed newcomers but veteran hobbyists as well. The RC scene is a very dynamic field, though, so learning new things is the name of the game. For starters, it means learning about labels, specs, ratings, and types of RC vehicle parts. If you think that’s a lot to take in, think again. Once you know enough to decide which one you want, say an RC motor, you’ll have to match that with the corresponding labels, specs, ratings, and types of your other parts. But you’re that kind of person—creative, DIY-keen, inspired, and into everything new in the RC scene—aren’t you? You must be, otherwise you wouldn’t be searching for the best brushless RC motor there is. 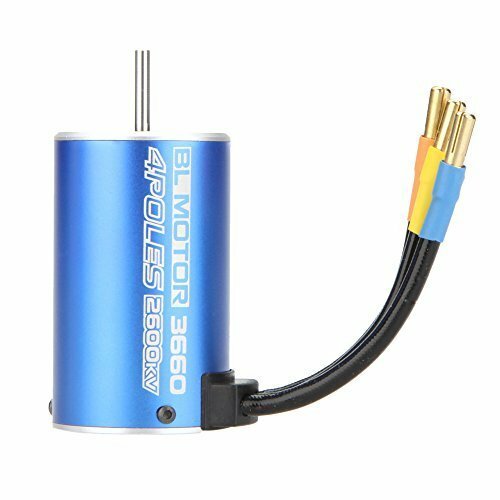 So what are the things that you have to look for when buying brushless RC motors? Our guide below covers the basics. A working knowledge of the specs of brushless RC motors comes in handy with this hobby. Whether you’re buying a ready-to-run (RTR) car, DIY-ing a custom model, matching a motor with electronic speed control (ESC), or doing an upgrade, you’ll need to assess the specs and suitability of a motor. RPM – refers to revolutions per minute. Higher RPM means faster rotation, higher power produced, and more speed for your project. So when looking at an RC car with a motor marked, say, 1800kV and powered by an 11.1V battery, this tells you that the unloaded motor will spin at 19,980 rpm. Choose high kV (faster rotation) if speed is your priority. The kV of a motor is constant. The RPM is not – it changes as the delivered voltage changes. Thus, when rating a motor, kV is a better measure than RPM. T refers to the number of wire windings or turns around the motor’s poles. The number of turns relates to the torque or strength of a motor. A higher number of turns means higher torque and lower speed. A lower number of turns means lower torque and higher speed. This is an oversimplified description, but there are a lot of complex factors at play here, so it should suffice for a working knowledge. Torque – is the turning power of a motor. It is dependent on the number of winds on the armature and the strength of the magnets. A motor with low kV has a lower top speed. With higher T, it uses a thinner wire which is wound around the armature many times. It will have higher torque, meaning it has more strength and acceleration power and will be capable of turning a heavier propeller. A motor with higher kV has more speed. It has lower T and uses a thicker wire with fewer winds. The combination of high kV and low torque is compatible with a small propeller and high RPM. 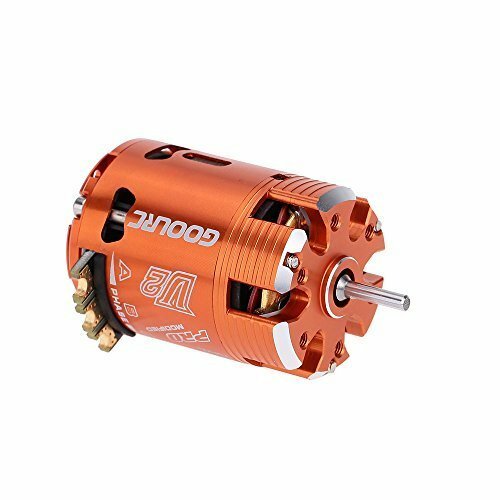 In short, your project and your purpose for it, whether it’s an FPV racing drone or heavy-lift quadcopter, must dictate what specs you look for in a motor. Speed should not be your sole consideration when buying a brushless RC motor. Amperage refers to the maximum current flow that the motor will draw. When you exceed the amp rating of a brushless RC motor, you run the risk of overheating it. Simply put, make sure to choose a motor with an amp rating that matches the application you have in mind for it. The result of this formula is the max amperage that your motor will draw using this setup. The amp rating tells you that the electronic speed control (ESC) you pick for the motor should have an amp rating higher than 49.55A so that your vehicle will perform at its maximum potential. An ESC with a lower amp rating will hold the motor back. The same goes for the battery pack; it has to have more than 49.55A to provide the motor with enough power. Watt is a measure of power and represents energy per unit time. Electronic devices and appliances are rated for the power they consume or generate. So watt rating indicates the rate at which a motor draws electrical energy from the battery and converts it into mechanical energy and heat. In our example, W = 550. The watt rating gives you an idea of the motor’s performance, although you’ll also have to consider efficiency and heat generated. There’s more about that under the next spec. Since the motor is rated for that power, exceeding the maximum will be tantamount to working it too hard, which may result in premature damage. The efficiency rating pretty much sums up how well the motor makes use of power. It’s the ratio of how much of the electrical input power the motor is capable of converting into mechanical output power. It also shows how much energy the motor loses as heat. Example: A motor rated at 550W with 90% efficiency generates 495W (.90 * 550) of mechanical power and loses only 55W (.10 * 550) as heat. Compare this to another 550W motor which has lower efficiency, say 70%. This low-efficiency motor will only produce 385W (.70 * 550) as kinetic energy and stands to lose 165W (.30 * 550) as heat. Note: This highlights the fact that, with a less-efficient motor, the greater heat produced not only risks damage to parts but also reduces performance. Different brands of brushless RC motors have different labels, but they mostly adopt one standard format that describes the motor size and kV rating. The format is eight numerals followed by kV. For example, a label may have these characters: 3670 2150kV. 36 – This means 36mm, which refers to the diameter of the RC motor’s housing. 70 – This means 70mm, which refers to the length of the RC motor’s housing. 2150kV – is the motor’s kV rating. We’ve noticed, though, that while most motor brands follow this format, some don’t. You’ll meet the terms “sensored” and “sensorless” in the brushless RC scene pretty often, so we’ll help you make the distinction between the two clear. Sensored brushless RC motors have hall sensors to tell the ESC the exact position of the rotor in the motor. These sensors give more “feel” to the motor and consequently, it performs more smoothly than the sensorless motor does. There will be no cogging or jerky starts, which are common issues with sensorless motors. You can recognize sensored motors by their appearance alone, as they have an extra multi-wire sensor loom. Somewhere on the housing’s exterior, there will be a port for this sensor loom. Inside the case of the motor, you will find the sensors. Sensorless brushless RC motors, as the name implies, have no sensors. Instead, they use back- or counter-electromotive force (back-EMF or counter-EMF), which tell the ESC the likely position of the rotor. Sensorless motors are less delicate to handle and less costly to maintain. They are more efficient than the sensored models at high speeds. For general racing and bashing purposes, these setups do an amazing job. However, if your vehicle does a lot of rock crawling, you’re better off using sensored brushless motors. You’re doing well so far. We’ve skimmed through the most important things to know before getting started, but don’t relax yet. Next, we need to find the right brushless RC motor for you. Below is our list of the top 7 best brushless RC motors which we’ve compiled based on how their specs compare with each other and their suitability for common projects. We’ve picked out models from both sensored and sensorless categories. Some of these RC motors come with ESC, which may or may not be what you need. 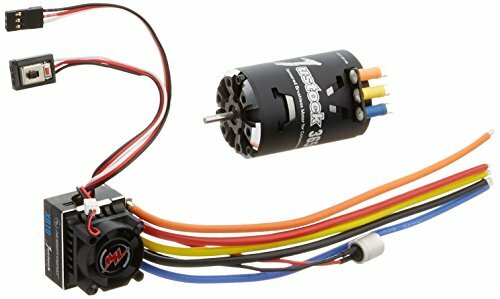 One advantage with combo brushless RC motors and ESC, though, is that you have an ESC that’s designed to handle the maximum amperage that the motor draws. 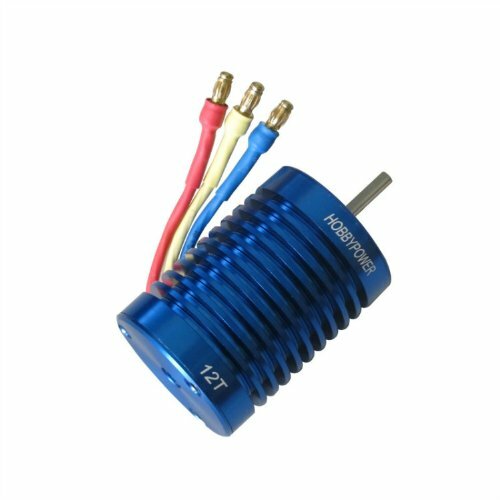 If you’re looking to upgrade to a brushless platform, out top recommendation is Kinexsis’ 1/10 4000kV model. This motor is fast and tough! Users find it perfect for general on-road racing and bashing, and it’s all muscle on 4WD off-road courses. With all that speed and power, the motor remains quiet and cool to the touch. Likewise, the waterproof ESC operates quietly. Overall, this is a combo that’s pretty hard to beat with its powerful performance, trouble-free setup, and inexpensive price tag. It runs on NiMH (4 to 9 cells) and LiPo (2S or 3S). 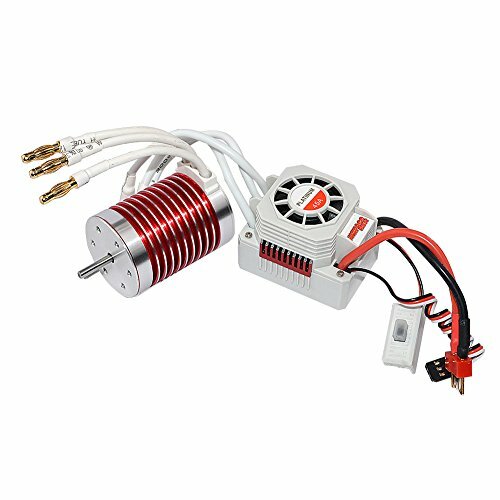 GoolRC’s 540 has about the same kV as Kinexsis’ motor and possesses the perfect top speed for racing-focused drift cars. Since this motor is sensored, it is the ideal option for off-road buggies and U4 cars. This impressive little motor provides high speed on command and exhibits good torque when needed. For rock crawling, though, you’ll need a motor with higher torque. GoolRC’s 3660 combines brute strength and high efficiency, making it compatible with monster trucks like E-Revo and the trophy trucks of Yeti. As expected from its kV, it has lower RPM but more torque. Due to this high torque, it manages to provide incredible speed to relatively heavy cars. What makes that more amazing is how coolly it handles the stress and intensity of 4WD racing. After a half-hour full-throttle run it hardly gets warm. That says a lot about its compact and temperature-resistant construction. This high-quality brushless RC motor has solid protection from overloading and overheating. It runs on 2S or 3S LiPo. For rock crawlers and trucks that are more focused on off-road sports racing, you’ll find no better option than this heavy-duty sensored high-torque brushless RC motor from HobbyWing. This updated version, which is the second generation of model 3650 21.5T, now uses high-grade aluminum. The new design greatly improves on ventilation and heat dissipation. This motor offers awesome acceleration power for dirt-road racing, with positively no cogging at low speeds. Expect power and smoothness because HobbyWing’s 21.5T delivers superbly. However, if you need speed, then pick sensorless – it wins every time, and it’s a lot less costly, too. Use 2S-3S LiPo for this motor. Balancing torque, wheel RPM, and cogging-free performance is one heck of an act, and this brushless motor does a great job at it. The top speed of RCRunning’s 540 is much higher than HobbyWing’s 21.5T. Though lower in torque, this motor is still powerful enough for those sharp accelerations in off-road racing. The advantage is this adaptability – a great balance of torque and wheel speed. For sport-focused off-road enthusiasts, this little brute will give your truck the power it needs. Monitor temps always. Make sure that you have the correct gear ratios when changing gears to avoid overheating issues. Use 3S LiPo input power. You can’t beat the price of this motor and waterproof ESC combo. With 3000kV and 13T, the Gentman F540 provides a sweet middle ground for those who need both speed and torque for RC drift racing. The low cap on voltage protects from overheating and loss of throttle signal. We’re impressed with the numbers in the summary of specs below – very high RPM and high enough T. The Deans or T connector comes already soldered to the ESC, which is a very thoughtful detail. The wire windings in the motor are made of high-grade copper, which has superior conductance and heat endurance. 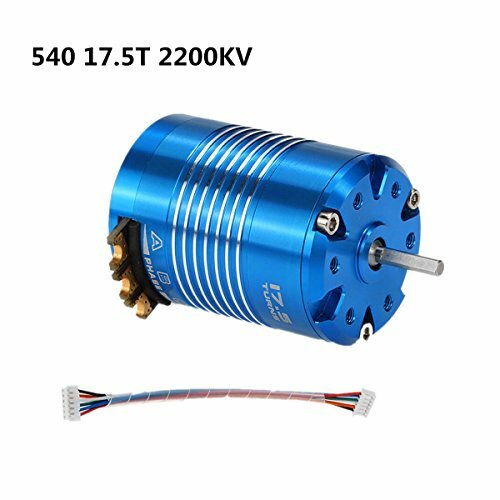 The specs for Hobbypower’s 3330kV motor are more or less similar to Gentman’s 3000kV model. They even have the same dimensions, and both use copper wire windings. The 3330 kV rating is a wise choice for your racing buggy or speedboat. The motor has high-quality magnets housed in an aluminum casing. Power this motor with 2S-3S LiPo or 6-9 cells NiMH/NiCd. The final decision depends on which holds more weight for you – high top speed or formidable torque. The middle ground would be within the range of 3000kV to 3500kV, which is suitable for brushless dune buggy racers. On-road racing models will need higher kV, while off-roaders generally need lower kV. So there you have it! We hope we have provided you with a valuable resource on how to find the best brushless RC motors for your next model. Great article that i’m definitely going to share with others both movies and experts.